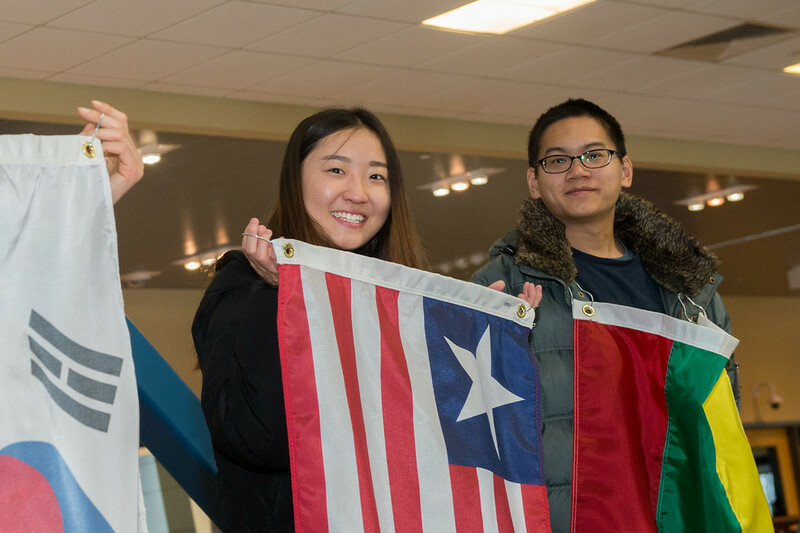 Far from his home in China and unsure of what to expect when he first arrived at Indiana State University, Yin Chen felt a new sense of welcome when he watched this week as his native country's flag was draped alongside the American flag and the national flags of 77 other countries represented on campus. 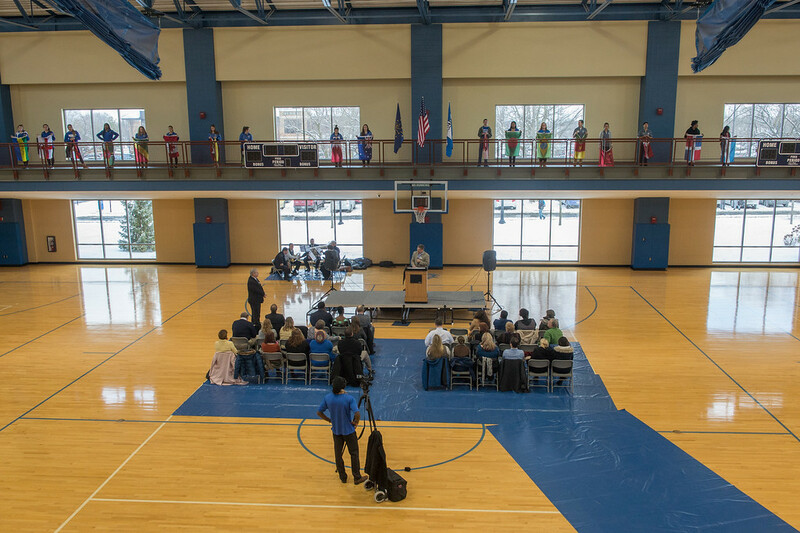 Including countries from Australia to Zimbabwe, Indiana State's newly installed permanent flag display brought the term ‘melting pot' alive for Chen and dozens of other international and domestic students and school officials who attended the ceremony at the Student Recreation Center's walking and jogging track. "Students from all around the world should be proud to have their native country's flag here," said Chen, a master of fine arts major from China who held the Jordanian flag during the ceremony, where a total of 81 flags were raised during ceremony, including 79 national flags, the Sycamore flag and Indiana's state flag. Funded by the Center for Global Engagement and the Division of Student Affairs, the display offers all who view it an important reminder, said Chris McGrew, director of the Center for Global Engagement. "Indiana, Terre Haute, and most importantly, Indiana State University, is not one color, one way of life, one perspective, but an explosion of diversity of thought and being," McGrew said." 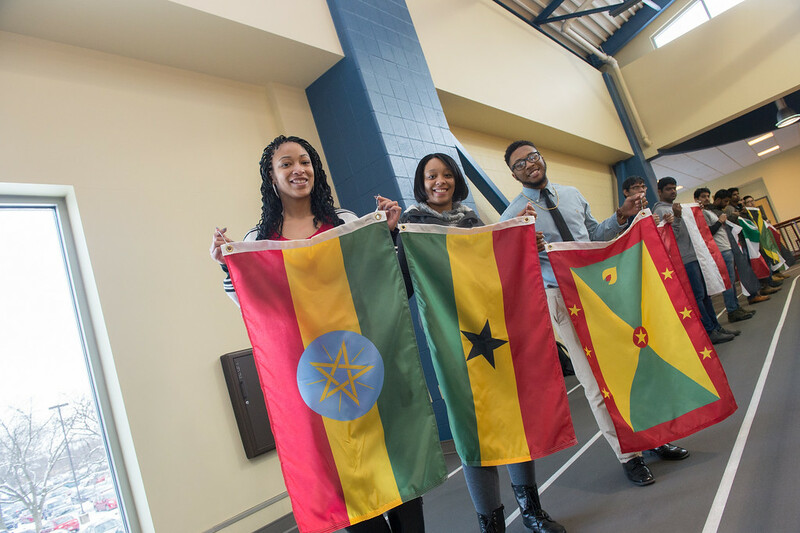 As the Rec Center invites the campus community to exercise the body, these flags remind us to exercise our minds. We are challenged to seek out ideas, to be critical and examine those ideas and to recognize the strength in the variety of perspectives represented by those ideas. A university is not a place to feel safe from the exposure to other perspectives. It is a place to learn how to deal with our own perturbed ideas, how to recognize that experiences bring a diversity of thinking that should be celebrated, not feared." By welcoming international students to campus for at least eight decades, Indiana State President Dan Bradley said generations of Sycamores have developed a better understanding of the world they live in. "I am proud of the deep and progressive history our institution has had in serving a diverse student body and am pleased to help pay tribute to the 79 nations our students represent today," he said. "It's the diverse backgrounds of everyone on campus that makes our university so vibrant," added Mike Licari, provost and vice president of academic affairs. "So, it's important today that we celebrate with a visual display of 79 flags from around the world." It was with the common goal of providing opportunities for the entire university community to develop a greater global competency through intercultural communication and interaction that helped the Division of Student Affairs and the Center for Global Engagement to bring the flag display to life. "The partnership between Student Affairs and Global Engagement continues the intentional efforts designed to develop and connect students - to the institution and to each other," said Brooks Moore, associate dean for student engagement, student activities and organizations. "This exhibit is part of a series of initiatives that help create a rhythm and pattern to university initiatives." For Vernon Cheeks, president of the Student Government Association, the event was evidence of his university taking steps in the right direction toward inclusion and global engagement. "These flags represent each student at Indiana State University and it is important to acknowledge students are welcomed and State celebrates different cultures," he said. "We all come from different backgrounds and ethnicities. We have one thing in common though, we are Sycamores." Although "being a tree" wasn't an idea Lola Akinlaja initially embraced when she arrived at Indiana State in 2012, she soon found a home on campus. "The now Center for Global Engagement afforded me an once-in-a-lifetime opportunity to get out of my head and think on a global level," said Akinlaja, who graduated in December with a bachelor's degree in chemistry. "At the welcome picnic, I got to meet and converse with students from countries all over the world. I have met and spoken with at least one person from each continent of the world. Some people are amazing if you would just take the time to know them." She discovered that quickly at Indiana State, where the Center for Global Engagement felt like her home and its staff an extension of her family. "I remember always being able to go to Zach's office to vent about anything and I knew that if I needed anything in an emergency, I could go there for help," Akinlaja said. "The work being done there enticed me, so I was honored when I got the opportunity to work there. We started creating a community of like-minded people who were interested in sharing and enjoying the diversity of our relationships." The flag hanging ceremony was a reminder to her that her alma mater is embracing these same values. 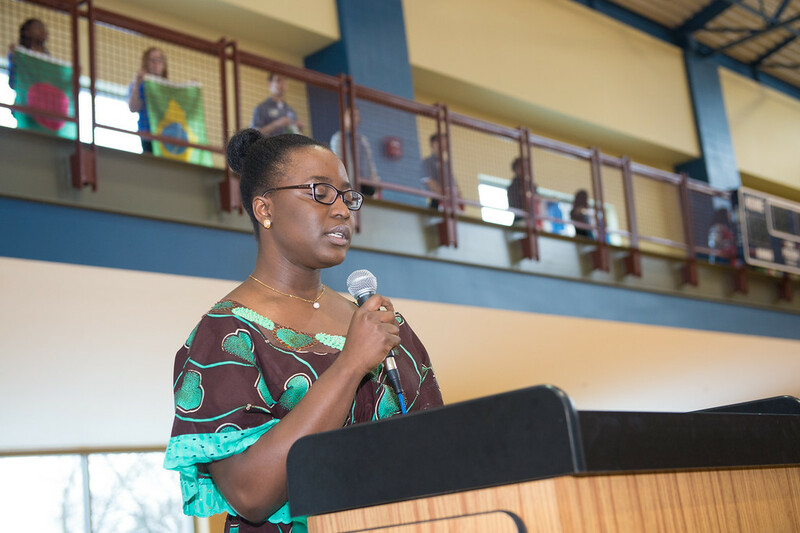 "The audiences that I have gotten, as a member of the International Student Leadership Council, with people from the president's office and even the president, have shown me a great deal of how much ISU embraces learning and change," Akinlaja said. "We have been able to discuss a number of issues and witness steps taken to change them for the better. Even though there is always a ways to go, I am privileged to be a part of this ceremony because I believe that this is the dawn of a new level of enlightenment at ISU. I couldn't be prouder to call Indiana State my alma mater." http://photos.indstate.edu/Events/Events-by-Year/2016/International-Flag-Ceremony/i-QM8FCH8/0/XL/January%2020%2C%202016%20International%20Flag%20Ceremony%20%202246 -XL.jpg - Lola Akinlaja, a 2015 December graduate with a bachelor's degree in chemistry and a native of Nigeria, speaks to the audience at the flag hanging ceremony at Indiana State University's Student Recreation Center on Jan. 20, 2016.
http://photos.indstate.edu/Events/Events-by-Year/2016/International-Flag-Ceremony/i-cQ74z6S/0/XL/January%2020%2C%202016%20International%20Flag%20Ceremony%20%202207-XL.jpg - Students of all backgrounds participated in the flag hanging ceremony on Jan. 20, 2016. A total of 81 flags were hung, including 79 national flags represernting the countries where Indiana State students come from, the Sycamore flag and Indiana's state flag. http://photos.indstate.edu/Events/Events-by-Year/2016/International-Flag-Ceremony/i-mw8BSMj/0/XL/January%2020%2C%202016%20International%20Flag%20Ceremony%20%202214-XL.jpg - The university community turned out at the Student Recreation Center on Jan. 20, 2016 for the hanging of 79 flags representing the home countries of Indiana State Univeristy students, as well as the Sycamore and Indiana's state flags. The display, funded by the Center for Global Engagement and the Division of Student Affairs, is a tribute to the positive impact international students have had on the campus community.